Sponsor Bronwyn Levvey as she walks 250km in 14 days, with her 3 'Ladies of Lungitude (LOL)' friends Philippa, Denise & Trudy, aiming to raise $2,500 for Lung Transplant Research. All donations of $2 or more are tax deductible. Click image or title to read more. Bronwyn and her friends are self-funding their Camino Trek adventure, with all proceeds raised from this campaign donated directly to lung transplant research. Bronwyn has seen first-hand how research can make a difference to patients and their carers, during her 20 plus year career in working in lung transplantation at The Alfred Hospital in Melbourne. Many of the innovations and improvements the transplant team have made to patient management and care over the past 15 years have been as a direct result of successful clinical studies conducted in the clinics and laboratory, and then applied directly to patient care at the bed-side and beyond. Without the generous support of donations from sponsors, and the amazing transplant patients who participate in these projects, such clinical research would not be possible. The Alfred’s Lung Transplant team continue to look for new ways to improve both the short and long term survival and quality of life for all patients and better ways support their carers. Sponsoring Bronwyn and ‘LOL’ friends as they trek 250km along the Portuguese coast and onto Santiago de Compostela in north-west Spain will help support new the new and innovative research projects the transplant team are currently undertaking. Wandering the World escorted 15-day, 250 kilometre pilgrimage known as the Portuguese Coastal Way or Camino da Costa. 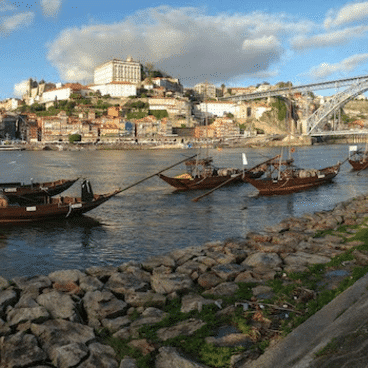 Starting from Porto, it is a stunning walk through seaside towns and villages of northern Portugal and the beautiful countryside of Spain, en route to Santiago de Compostela. Portugal emerged as a country in 1143, and is steeped in history. From the mid-12th century, the way of Saint James and the pilgrimage to Santiago de Compostela has been a feature on the paths and roads across Portugal. This route was used by Queen Isabel of Portugal (1271 – 1336) to make at least one pilgrimage to Santiago de Compostela. The hospitality offered to pilgrims started in the middle-ages by monks and clergymen, still continues today along the less travelled Portuguese Way (‘the friendly Camino’) where all villages and towns participate with their generosity and warm welcome.